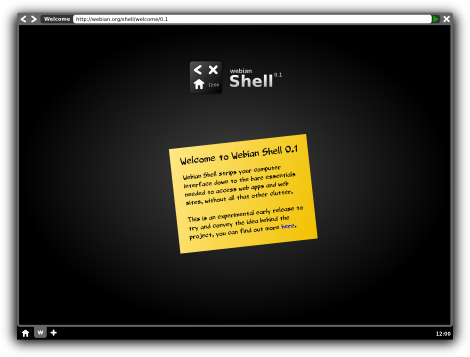 (Reposted from the Webian blog) Webian Shell is a full screen web browser for devices that don't need a desktop. As of today you can download a prototype which you can try for yourself. If you’re anything like me then you’ll find that most of the stuff you do on your PC these days happens in a web browser and the desktop environment you used to depend on is now just getting in your way. Modern web applications can do just about everything traditional desktop applications can do (like flashy graphics, sound, video and offline storage) so often all you really need is the browser. The idea of the Webian Shell project is to replace your computer’s interface with something much simpler, which treats web applications as first class citizens and does away with all the un-necessary clutter. You can find out more on the Webian web site or go straight ahead and download and install Webian Shell 0.1 on your Mac, Windows or Linux computer today. I’d really love to hear your feedback! You can propose ideas, report bugs and ask questions on GetSatisfaction, or join the Google Group to take part in the conversation. You can also follow Webian on Twitter or Identi.ca, like it on Facebook and check out the channel on YouTube.